Quiapo Church has survived it all, bombs, earthquakes and invasions! Quiapo Church is one of the most important in the Philippines, at the crossroads Manila city itself. Filipinos endure much but take delight in little things and are, at heart, ardent Catholics. Call it folk religion, but the signs and shrines of national piety are all over the islands. Day in and day out, people from all over the metropolis come around, each for his own personal petition. Some pray for a miracle from the heavenly Father that will somehow turn around their lives or those of their loved ones. Others traverse the central aisle on their knees, from main door to altar, hoping to be forgiven for some grave sin that they have committed. Thieves, murderers, alcoholics, abortionists, addicts on the rebound, drug pushers, ex-cons…Quiapo Church sees them all sooner or later. Quiapo Church lies in the heart of Manila, still pretty much “downtown” and market center for the entire metropolis. 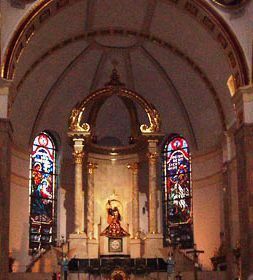 This fascinating church was built in 1582, just 20 years after the Legazpi expedition took Manila for King Philip II. At the time, the friars must have thought to convert the natives who lived across the Pasig River from Intramuros. Certainly, they did not do it for their health because the whole Quiapo district was a morass of malarial swampland and streams that drained into the Pasig. 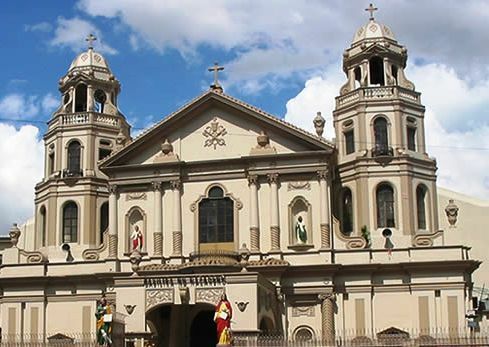 Amazing enough, Quiapo Church withstood earthquake, riot, rebellion and bombardment through nearly 400 years of Spanish rule and invasions by Chinese pirates, the Dutch, Portuguese, British, the Americans and Japanese. In World War II, only Quiapo Church and two nearby schools escaped unscathed the leveling of the city for at least a mile around. No less than seven other bridges cross the river that bisects the capital but all major transport routes end up in Quiapo because of the church, the riverside market that used to purvey the cheapest produce and the Chinese merchants strung out all the way to Binondo, a scant five blocks west. This is civilization Spanish style, after all: go to market and cross the plaza to hear mass. In the case of Quiapo, the magnet is the Black Nazarene. Except for a few ethnic churches in the United States (for whom the mahogany-skinned Nazarene is a pious expression of Black pride), Manila must be the only place in the world where devotion to the mercy of the suffering Black Nazarene remains huge. It is a devotion that culminates on the 9th of January in a solemn procession that is uniquely folk religion, Filipino style. Keep an eye out for the pick-pockets. Unhappily, some miscreants and swindlers hang around not to make their devotions but to prey on the believers. Outside the church and within its shrinking compound, the most innocuous are those who sell pamphlets of the novena to Jesus Christ, rosaries and the candles with which devout Catholics make their “burnt offerings” of eons past. But Quiapo is also known for the sidewalk stalls of assorted herbal remedies, potions, oils, and magical crystals to heal any ailment and even cast out evil spirits. The sidewalks are also choked with fortunetellers and soothsayers. Taking advantage of people’s firm faith, these vendors purvey tarot readings, palmistry and assorted amulets to ward off some enemy’s hex perhaps or shield a soldier from bullets when fighting rebels in the hinterlands. The pious seek to attain some comfort and bulwark against the hardships of life. Still Quiapo Church stands, never designed in the inspiring Gothic style (unlike San Sebastian three blocks east) nor designated a cathedral by Rome. It is a perfectly ordinary church, enlarged through time because it has such a hold on the souls of so many Filipino faithful.